The ItemPick and BoxPick components are optional on-board components of the rc_visard. The components are optional and require separate ItemPick or BoxPick licenses to be purchased. The components provide out-of-the-box perception solutions for robotic pick-and-place applications. ItemPick targets the detection of flat surfaces of unknown objects for picking with a suction gripper. BoxPick detects rectangular surfaces and determines their position, orientation and size for grasping. The interface of both components is very similar. Therefore both components are described together in this chapter. sorting of grasps according to gravity so that items on top of a pile are grasped first. In this chapter, cluster and surface are used as synonyms and identify a set of points (or pixels) with defined geometrical properties. In this chapter, load carrier and bin are used as synonyms and identify a container with four walls, a floor and a rectangular rim. BOX, with dimensions box.x, box.y, box.z. The user can specify the region of interest pose in the camera or the external coordinate system (see Hand-eye calibration). Both components can persistently store up to 10 different regions of interest, each one identified by a different id. The configuration of regions of interest is normally performed offline (e.g. on the ItemPick or BoxPick page of the rc_visard Web GUI), during the set up of the desired application. As opposed to the component parameters, the configured regions of interest are persistent even over firmware updates and rollbacks. The region of interest can narrow the volume that is searched for a load carrier model, or select a volume which only contains items to be grasped. If the region of interest filter is not applied, the components process the whole scene visible to the camera. A load carrier (bin) is a container with four walls, a floor and a rectangular rim. It is defined by its outer_dimensions and inner_dimensions. The load carrier detection algorithm is based on the detection of the load carrier rectangular rim. By default, the rectangular rim_thickness is computed from the outer and inner dimensions. As an alternative, its value can also be explicitly specified by the user. Typically, outer and inner dimensions of a load carrier are available in the specifications of the load carrier manufacturer. The load carrier reference frame is defined such that its origin is at the center of the load carrier outer box, its z axis is perpendicular to the load carrier floor and its x axis is directed along the direction of maximum elongation of the load carrier. Fig. 50 Load carrier models and reference frame. The user can optionally specify a prior for the load carrier pose. The detected load carrier pose is guaranteed to have the minimum rotation with respect to the load carrier prior pose. If no prior is specified, the algorithm searches for a load carrier whose floor is perpendicular to the estimated gravity vector. The components can persistently store up to 10 different load carrier models, each one identified by a different id. The configuration of a load carrier model is normally performed offline (e.g. on the ItemPick or BoxPick page of the rc_visard Web GUI), during the set up the desired application. As opposed to the component parameters, the configured load carrier models are persistent even over firmware updates and rollbacks. The modules enable the computation of grasps for a specific volume of the load carrier (load_carrier_compartment). The compartment is a box whose pose is defined with respect to the load carrier reference frame. Fig. 51 Compartment inside a load carrier. A grasp provided by the ItemPick and BoxPick components represents the recommended pose of the TCP (Tool Center Point) of the suction gripper. The grasp orientation is a right-handed coordinate system and is defined such that its z axis is normal to the surface pointing inside the object at the grasp position and its x axis is directed along the maximum elongation of the surface. The computed grasp pose is the center of the biggest ellipse that can be inscribed in each surface. Fig. 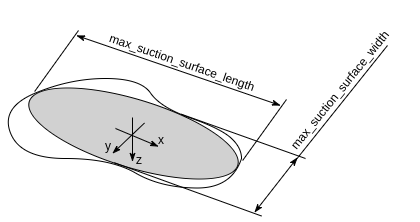 52 Illustration of suction grasp with coordinate system and ellipse representing the maximum suction surface. Each grasp includes the dimensions of the maximum suction surface available, modelled as an ellipse of axes max_suction_surface_length and max_suction_surface_width. The user is enabled to filter grasps by specifying the minimum suction surface required by the suction device in use. In the BoxPick component, the grasp position corresponds to the center of the detected rectangle and the dimensions of the maximum suction surface available matches the estimated rectangle dimensions. Detected rectangles with missing data or occlusions by other objects for more than 15% of their surface do not get an associated grasp. The grasp definition is complemented by a uuid (Universally Unique Identifier) and the timestamp of the oldest image that was used to compute the grasp. The ItemPick and BoxPick components allow to specify a model for the items to be picked. Each item model includes minimum and maximum dimenstions of the expected items. The ItemPick component supports specifying the minimum and maximum sizes of unknown flexible and/or deformable items. The BoxPick component supports specifying the minimum and maximum length and width of several rectangles. Internally, the ItemPick and BoxPick components depend on, and interact with other on-board components as listed below. All changes and configuration updates to these components will affect the performance of the ItemPick and BoxPick components. Disparity, error, and confidence images from the Stereo matching component (rc_stereomatching). For each load carrier detection and grasp computation, the components estimate the gravity vector by subscribing to the IMU data stream from the Sensor dynamics component (rc_dynamics). The gravity vector is estimated from linear acceleration readings from the on-board IMU. For this reason, the ItemPick and BoxPick components require the rc_visard to remain still while the gravity vector is being estimated. In case the rc_visard is used in conjunction with an external random dot projector and the IO and Projector Control component (rc_iocontrol), the output mode for the GPIO output in use should be se to ExposureAlternateActive, as explained in the Description of run-time parameters of the IO and Projector Control component. No additional changes are required to use the ItemPick and BoxPick components in combination with a random dot projector. Camera frame (camera). All poses provided to and from the component are in the camera frame, and no prior knowledge about the pose of the rc_visard in the environment is required. This means that the configured regions of interest and load carriers move with the camera. It is the user’s responsibility to update the configured poses if the camera frame moves (e.g. with a robot-mounted sensor). External frame (external). All poses provided to and from the component are in the external frame, configured by the user during the hand-eye calibration process. The component relies on the on-board Hand-eye calibration component to retrieve the sensor mounting (static or robot mounted) and the hand-eye transformation. If the sensor mounting is static, no further information is needed. If the sensor is robot-mounted, the robot_pose is required to transform poses to and from the external frame. If no hand-eye calibration is available, all pose_frame values should be set to camera. All pose_frame values that are not camera or external are rejected. The ItemPick and BoxPick components are called rc_itempick and rc_boxpick in the REST-API. The user can explore and configure the rc_itempick and rc_boxpick component’s run-time parameters, e.g. for development and testing, using the rc_visard Web GUI or Swagger UI. cluster_max_dimension float64 0.05 0.8 0.3 Only for rc_itempick. Diameter of the largest sphere enclosing each cluster in meters. Clusters larger than this value are filtered out before grasp computation. cluster_max_curvature float64 0.005 0.5 0.11 Maximum curvature allowed within one cluster. The smaller this value, the more clusters will be split apart. clustering_discontinuity_factor float64 0.5 5.0 1.0 Factor used to discriminate depth discontinuities within a patch. The smaller this value, the more clusters will be split apart. data_acquisition_time Time in seconds required by the last active service to acquire images. Standard values are between 0.5 s and 0.6 s with High depth image quality. The reported state can take one of the following values. IDLE The component is idle. RUNNING The component is running and ready for load carrier detection and grasp computation. FATAL A fatal error has occurred. The user can explore and call the rc_itempick and rc_boxpick component’s services, e.g. for development and testing, using Swagger UI or the rc_visard Web GUI. Each service component provides a return_code, which consists of a value plus an optional message. A successful service returns with a return_code value of 0. Negative return_code values indicate that the service failed. Positive return_code values indicate that the service succeeded with additional information. The smaller value is selected in case a service has multiple return_code values, but all messages are appended in the return_code message. The ItemPick and BoxPick components offer the following services. Starts the component. If the command is accepted, the component moves to state RUNNING. The current_state value in the service response may differ from RUNNING if the state transition is still in process when the service returns. Stops the component. If the command is accepted, the component moves to state IDLE. The current_state value in the service response may differ from IDLE if the state transition is still in process when the service returns. Persistently stores a region of interest on the rc_visard. All configured regions of interest are persistent over firmware updates and rollbacks. See Region of Interest the definition of the region of interest type. Returns the configured regions of interest with the requested region_of_interest_ids. If no region_of_interest_ids are provided, all configured regions of interest are returned. Deletes the configured regions of interest with the requested region_of_interest_ids. All regions of interest to be deleted must be explicitly stated in region_of_interest_ids. Persistently stores a load carrier on the rc_visard. All configured load carriers are persistent over firmware updates and rollbacks. See Load Carrier for the definition of the load carrier type. Returns the configured load carriers with the requested load_carrier_ids. If no load_carrier_ids are provided, all configured load carriers are returned. Deletes the configured load carriers with the requested load_carrier_ids. All load carriers to be deleted must be explicitly stated in load_carrier_ids. Triggers a load carrier detection. All images used by the node are guaranteed to be newer than the service trigger time. pose_frame: only if a pose frame is not already specified by the selected region of interest or load carrier pose prior. If a pose_frame is provided but not required, its value must be consistent with the selected region of interest pose frame and load carrier prior pose frame, otherwise the service will return with an invalid argument error. robot_pose: only if working in pose_frame="external" and the rc_visard is robot-mounted. region_of_interest_id: delimits the volume of space where to search for the load carrier. The processing time for load carrier detection increases with the size of the selected region of interest. Triggers the detection of rectangles. Processing includes load carrier detection in the region of interest. The poses are given relative to the centers of the rectangles. The z-axis points towards the camera. Multiple rectangles can be specified with different dimension ranges. All images used by the node are guaranteed to be newer than the service trigger time. If successful, the service returns a list of rectangles and (optionally) the detected load carriers. item_models: defines a list of rectangles with minimum and maximum size, with the minimum dimensions strictly smaller than the maximum dimensions. At least one item_model is always required. The dimensions should be given as precise as possible to avoid misdetections. region_of_interest_id: delimits the volume of space where to search for the load carrier or selects a volume which contains items to be grasped if no load_carrier_id is set. The processing time for load carrier detection and grasp computation increases with the size of the selected region of interest. load_carrier_id: limits grasp computation to the content of the detected load carrier. load_carrier_compartment: selects a compartment within the detected load carrier. Triggers the computation of grasping poses for a suction device. All images used by the node are guaranteed to be newer than the service trigger time. If successful, the service returns a sorted list of grasps and (optionally) the detected load carriers. suction_surface_length: length of the suction device grasping surface. suction_surface_width: width of the suction device grasping surface. item_models: defines a list of unknown items with minimum and maximum dimensions, with the minimum dimensions strictly smaller than the maximum dimensions. Only one item_model of type UNKNOWN is currently supported. Triggers the detection of rectangles and computation of a grasp pose for the detected rectangles. The poses are given relative to the centers of the rectangles. Multiple rectangles can be specified with different dimension ranges. All images used by the node are guaranteed to be newer than the service trigger time. If successful, the service returns a list of rectangles, a list of computed grasps and (optionally) the detected load carriers. Each grasp includes the uuid of the corresponding rectangle and vice versa. This service saves the currently set parameters persistently. Thereby, the same parameters will still apply after a reboot of the sensor. The node parameters are not persistent over firmware updates and rollbacks. This service resets all parameters of the component to its default values, as listed in above table. The reset does not apply to regions of interest and load carriers.